72 years ago, in August 1945 the first two atomic bombs were dropped on Hiroshima and Nagasaki. In the wake of the massive levels of destruction already perpetrated during World War Two with all sorts of weapons, in particular incendiary bombs, the use of nuclear weapons ushered in a new stage of potential destructiveness, menacing all life on the planet. On 9 September 2017, on the occasion of the commemoration of the establishment of the North Korean regime, the media showed us a huge state-organised party with a beaming Kim Jong-un praising the country’s hydrogen bomb as “an extraordinary accomplishment and a great occasion in the history of our people”. North Korea had successfully carried out a nuclear explosion, the force of which by far exceeded any of its previous tests. North Korea has joined the exclusive club of the nuclear powers of the world. The news of this latest step of the descent of bourgeois society into barbarism did not arrive out of the blue. The macabre triumph of the technology of mass destruction on the part of the Stalinist regime in Pyongyang is a culmination point of months of mutual threats between the United States of America and the Democratic People’s Republic of Korea. North Korea has already carried out 17 missile tests this year – more than all the previous ones put together. 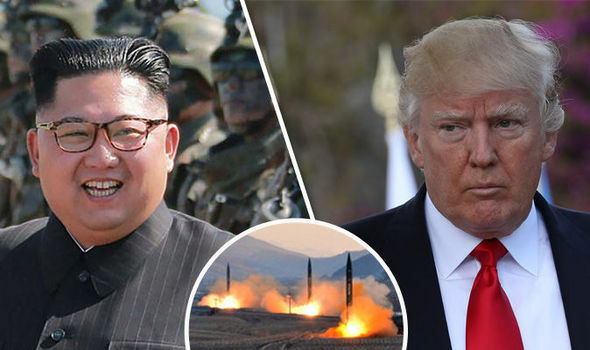 With the threats to attack the US Pacific island of Guam or targets on the American continent, with missiles flying over Japan, and the threat to defend itself with nuclear weapons in case of a US attack, the showdown between North Korea and the US has reached a new stage. The US threatens to respond with their whole arsenal of military, economic and political weapons: President Trump talks about visiting North Korea with “fire and fury” if the US or any of its allies are attacked by the regime. The risk of the use of nuclear weapons puts the stakes much higher than ever before and poses a direct threat to some of the biggest metropoles of Asia – Seoul, Tokyo, etc. The recent military steps by the US and its allies South Korea and Japan (in particular the installation of the new THAAD missile systems in South Korea) have sharpened the confrontation between the US and China and pulled other countries even more into this maelstrom. How can we explain these events in Korea and what do they mean for humanity? For decades, during the cold war, it was mainly the big powers that were armed with nuclear bombs. But after 1989 a number of other countries have gained access or are trying to gain access to the nuclear bomb, which make the threat of mutual destruction even more unpredictable. Different factors must be taken into account in order to understand why “underdogs” such as North Korea have been developing the capacity to make nuclear threats. These developments can only be understood in a broader historical and international context. Following the devastation of World War Two and the Korean war which followed only a few years later, both North and South had to rely for their reconstruction on their “protectors“. North Korea became dependent on China and Russia, two countries ruled by Stalinist regimes which were unable to compete on the world market, since they were lagging behind the more advanced capitalist countries. Russia had become a bloc leader following the defeat of Nazi Germany, but it had been severely depleted by the war and now had to dedicate the greater part of its resources to the new arms race of the Cold War. The civilian sector was lagging ages behind the military sector. The contrast between the blocs was summed up by the fact that an exhausted Russia had to dismantle factories in Eastern and Central Europe, while the US poured large amounts of money (the Marshal plan) specifically into German and South Korean reconstruction. North Korean reconstruction followed the Stalinist model. Although more developed economically than the South before 1945 and better equipped with raw materials and energy resources, the North suffered from a similar backwardness – typical of regimes suffocated by militarism and run by a Stalinist clique. In the same way as the Soviet Union was unable to become economically competitive on the world market, and was heavily dependent on the use of, or threat to use, its military capacities, North Korea has been unable to compete at the economic level on the world market. Its major export products are weapons, some raw materials, and recently cheap textiles as well as parts of its labour power, which the North Korean regime sells in the form of “contract workers” to companies in other countries. At the same time the dependence on its defenders China and Russia has risen so much that 90% of North Korean trade is with China. Ruled by a party dictatorship which keeps tight control over the army, and where any rival bourgeois factions have been eliminated, the regime has the same congenital weaknesses as all regimes under Stalinist control, but it has survived through decades of scarcity, hunger, and repression. The military and police apparatus have been able to prevent any rising of the population, in particular of the working class. In comparison to the decade long rule of other dynasties in other backward countries, North Korea holds the record of a single dynasty terrorising the population for more than sixty years (Kim Il-sung, Kim Jong-il, Kim Jong-un) and forcing it to bow down to the most grotesque personality cult. Faced with the nationalist ambitions of the South, with the imperialist interests of the US, unable to count on any economic strength, the regime can only fight for its survival with ferocious repression inside and through military blackmail towards the outside. And in the age of nuclear weapons the blackmail has to be terrifying enough to deter your enemies. Kim Jong-un sees the nuclear bomb as his life insurance. As Kim Jong-un himself has declared in public, he has drawn the lesson of what happened in Ukraine and Libya on the one hand, in Pakistan on the other. After the break-up of the USSR, the newly formed Ukrainian state was obliged – under massive pressure not only from Moscow but also Washington – to hand over the nuclear arms on its territory to the Russians. As for Libya, it agreed to abandon its attempts to acquire an atomic bomb in exchange for the ending of the international isolation of the Qadafi regime in Tripoli. A similar fate occurred to Iraq, where Saddam Hussein's regime dropped its nuclear programme following the threats above all by the US. Pakistan, on the other hand, succeeded in acquiring “the bomb”. What is striking about these examples is how differently countries tend to be treated, depending on whether or not they possess a nuclear capacity. To this day, the United States has never even threatened Pakistan militarily. And this despite the fact that the regime in Lahore is still a prominent supporter of the Taliban in Afghanistan, harboured Bin Laden, and has moved ever closer to China, the main rival of the USA. As opposed to this, Ukraine, stripped of its nuclear weapons, was militarily attacked by Russia, and Libya by France and Britain (with the US in the background). The lesson is clear: in the eyes of their leaders “the bomb” is perhaps the most effective means for weaker powers to avoid being pushed around too much or even being overthrown by the stronger ones. This policy is of course considered to be unacceptable by the big powers, who have been disposing of nuclear arsenals for decades and used the nuclear threat themselves for their own imperialist interests. Despite the Cold War being over all the existing nuclear powers (USA, Russia, China, France, GB) have all kept a gigantic arsenal of nuclear weapons – an estimated 22.000 nuclear bombs. And the US – as the only remaining superpower, although weakened and challenged everywhere in the world - has allowed its long-standing ally Israel or a country such as India to equip themselves with the nuclear bomb, as long as these are considered to be of some help to the US (as in the case of India, which is seen as a counter-weight to China and Pakistan). Thus the US themselves contributed to the proliferation of nuclear weapons. Amongst the existing nuclear powers, so far only Russian and Chinese missiles can reach US territory, Iranian missiles (whether equipped with nuclear warheads or not) cannot. North Korea would be the first “rogue” state to be able to do so. This is unbearable for the US. During the time of the Cold War, the threat of the use of nuclear weapons was limited to the big powers. Since 1989 nuclear proliferation has meant that more countries have gained access to them, or could quickly produce them; and nobody can exclude the danger that these weapons might fall into the hands of terrorist groups. The threat of a “bi-polar” nuclear holocaust has been replaced by the even greater nightmare of “multi-polar” nuclear genocide. But the new escalation cannot just be explained by the specificities of the North Korean regime and its struggle for survival. The conflict in Korea itself has another quality because of the geostrategic position of Korea and its importance for the US and China in the sharpening of their global imperialist rivalries. Korea has always been the target of the imperialist ambitions of its neighbours. As we wrote in our special issue of the International Review devoted to the Far East, “The reasons are obvious: surrounded by Russia, China and Japan, Korea’s geographic position makes it a springboard for an expansion from one country towards another. Korea is inextricably lodged in a nutcracker between the Japanese island empire and the two land empires of Russia and China. Control over Korea allows control over three seas – the Japanese sea, the Yellow sea and East China Sea. If under the control of one country, Korea could serve as a knife in the back of other countries. Since the 1890s, Korea has been the target of the imperialist ambitions of the major sharks in the area initially only three: Russia, Japan and China - with the respective support and resistance of European and US sharks acting in the background. Even if, in particular, the northern part of Korea has some important raw materials, it is above all its strategic position which makes the country such a vital cornerstone for imperialism in the region”. Especially since the carve-up of the country in the Korean war, North Korea has been serving as buffer between China and South Korea and thus, between China and the US. If the regime in the North fell, not only would South Korean troops but also US troops be stationed closer than ever before to the Chinese border – a nightmare for China. Thus China is condemned to support the regime in North Korea in order to defend its own borders above all against the US. Given the tendency for the North Korean regime to act in an unpredictable and maverick manner, China has to go along with certain sanctions against Pyongyang, but it opposes the complete strangling of the regime. For China the aggressive policy of the North Korean regime is a double-edged sword: on the one hand it provokes a stronger military response from the US, South Korea and Japan, weakening the Chinese position in its northern flank, yet possibly leaving it more room for manoeuvre in its southern flank (for example the South China Sea). But the collapse of the North Korean regime would make it much more vulnerable vis-a- vis the US and its arch enemy Japan. And the consequences of a possible collapse of the North Korean regime and the wave of refugees escaping to or via China are extremely daunting for Beijing. Although threatened and undermined in their position, the US can – paradoxically – at the same capitalise from the North Korean threats because they are a welcome justification for strengthening its own military presence or that of its allies around China. We can assumethat if North Korea had not acted so provocatively, the US could not have installed so easily the new THAAD weapons system in South Korea. Any weapon stationed in South Korea can easily be used against China, so what is presented as a “defensive” weapon for South Korea at the same time is an “offensive” weapon against China. The conflict between North and South Korea and the US is aggravated by the new constellation in the Far East. Almost simultaneously with its economic ascension since the 1990s, China also began to develop new imperialist ambitions. Thus we have seen the modernisation of its army, the establishment of the “String of Pearls” naval bases around its territory and in the waters of the Indian Ocean and South East Asia - a kind of military occupation of at least of parts of the South China Sea; the construction of a military base in Djibuti; increased economic weight in Africa and Latin America; combined manoeuvres with Russia in the Baltic Sea, the Mediterranean and in the Far East etc. The US has declared China the number one threat to be contained. This is why the process of rearming Japan (maybe even allowing it nuclear bombs), like the increased military efforts in South Korea, are part of a global strategy both to protect South Korea and to contain China. Of course this has given an extra boost to the US armaments industry. Along with Saudi Arabia, South Korea has become one of the most important customers of the US armaments industry. Its contribution to financing the enormous military apparatus of the USA is today considerable. At the same time, given the fact that North Korea now has the capacity for nuclear strikes, this makes it much harder for US imperialism to strike back militarily in this area and it is likely to intensify its resolve to react against China in other hotspots. Any direct military confrontation with North Korea would trigger a chain of destruction on both sides. Half of the South Korean population lives in the Seoul area and many of the 250,000 US Americans in South Korea live in this area – all within easy reach of North Korean missiles. Trump's “fire and fury” threats would not only lead to the deaths of a very high number of Koreans, but also of many US citizens. The annihilation of the regime in the North could only be achieved at the cost of gigantic destructions in South Korea – not to mention the escalation this would meant the world-wide imperialist level. The dominant view of these developments in the mainstream press is that they are the consequence of having a madman in power in Pyongyang, or of the matching narcissism and irrationality of both Kim Jong-un and Donald Trump. It’s true that both present many interesting features for a psychoanalytical study, and that their way of speaking and acting gives the escalation a spectacular and almost hysterical tone. But we have already seen that from the point of view of the defence of his national capital, Kim Jong-un’s nuclear policies make a good deal of sense. The real irrationality is located at a greater depth – in the irrationality of national competition in an era of advancing capitalist decay. The arms race in the Far East is only one expression of the spreading cancer of militarism, in turn a necessary product of a social system trapped in a historical impasse. No politician, whatever their psychological profile, can evade the deadly logic of this system. The very intelligent and articulate Barack Obama promised to scale down the Bush administration’s disastrous engagement in the Middle East, and yet if it withdrew troops from Iraq or Afghanistan it was obliged to increase its presence in the Far East. Trump criticised his predecessors for their inability to avoid involvement in “foreign wars”, especially in the Middle East, but has now had to increase the US military presence almost everywhere, including in the Middle East. In reality, both Obama and Trump have both demonstrated that the grip of militarism is stronger than the declarations or desires of individual politicians. History has shown that China has paid a high price in the struggle over Korea. In the Korean war Mao Tse-tung's troops staged their first foreign invasion, suffering heavy losses, and ever since World War Two and even more following the Korean war the US have been able to use the Chinese threat to justify the maintenance of huge bases in the region. In addition there is China’s rivalry with Japan. In such a context, when there is no question of China employing weapons against South Korea at the moment, China has been playing the economic card. Its goal is to make South Korea as much as possible dependent on the Chinese economy. Already today, the main export market of South Korea is China (around 23%), no longer the United States (around 12%). And South Korea is the fourth biggest export market for Chinese products. The symbol of the serious setback this policy has suffered is the installation of the THAAD anti-missile system in South Korea. Beijing felt obliged to immediately react with the threat of economic sanctions against Seoul. The policy of Beijing towards Pyongyang for some time now has been to try and persuade it to follow the example of China itself or of Vietnam: privatisation of state companies and the opening up to foreign investments, while maintaining the Stalinist party in power. Kim Jong-un has proven himself to be much more open to such idea than his father. Anything between 30% and 50% of the economy is said to be in private hands today – which as experience from the Eastern European countries, Russia and China has shown, means mainly in the hands of cliques belonging to the party or loyal to the party, and of the army itself. [i] Even though these privatisations are not official (they have no legal basis, so that they can be revoked at any moment), they do seem to have made certain branches of the economy more efficient. Even a mobile telephone system of its own, with one million users, has been set up (with the help of a Egyptian company). But despite all of this, relations between Beijing and Pyongyang have worsened steadily in recent years, and the degree of influence which the former has on the latter has clearly been waning. The main area of conflict is the nuclear programme. While going along with the Chinese proposals for economic development to a certain extent, Kim Jong-un has always insisted that his first priority is “the bomb”, not the economy. For him, the bomb is the guarantee of the survival of his regime. Once this has been achieved, he says, we will see about the economy. Kim's bomb is thus not only the symbol of the limits of Chinese influence; it also shows how much military interests outweigh those of the economy. Because China is not a bloc leader and cannot impose any “discipline” on North Korea, this adds an additional element, where the tendency towards “every man for himself” makes the situation all the more unpredictable. Finally, it has to be stressed that while Kim Jong-un and his army gamble for their survival with the help of the bomb, reckoning with the desire of the US to avoid a nuclear conflict, such a calculation has never stopped capitalism’s rulers from carrying out a policy of scorched earth and risking their own annihilation in order to cling to power, or merely out of a lust for revenge. Did Hitler have any hesitations about ordering massacres and executions until his last breath; has Assad not been accepting the destruction of large areas of his own country to stay in control? In the Far East we can thus see a sharpening of the tensions between the main rivals US and China, with Russia and Japan ganging up behind these two leading powers. But none of these leading powers have grouped a military bloc behind them. Japan and South Korea support the US to the extent the US can offer some level of protection against North Korea and China, but they are no US lackeys and they constantly look for their own room to manoeuvre. And South Korea and Japan also have territorial conflicts between themselves over certain islands. Meanwhile other countries which in the past supported the US, such as the Philippines which relies on US military support to fight against terrorists of all kinds within the country, have threatened to take sides with China in the conflict in the South China Sea; and Duterte has also been sounding of about the possibility of buying Russian and Chinese weapons instead of those delivered by western countries. And within Korea itself, even though the US remains an indispensable bodyguard, the Americans cannot count on unconditional loyalty from the ruling factions of South Korea, some of whom feel they are just one figure on the chessboard for the US. Because they both serve as vital buffers against bigger rivals, all the imperialist sharks of the region have an interest in keeping Korea divided. The same goes for the regime in Pyongyang. However, the South Korean ruling class has always dreamt of and periodically been aiming at reunification. The so-called “Sunshine policy” of advocating growing cooperation with Pyongyang is one attempt to pave the way towards some long-term settlement with the final hope of unification. This dream within the South Korean ruling class became stronger after the unification of Germany in 1990. This gave a boost to the aspirations of the South to put the unification of Korea back on the agenda of world politics. Following the German example, South Korean politicians began to formulate their “Sunshine” policy as a kind of Korean version of the Ostpolitik of the West German chancellor Willy Brandt in the 1970s. Its goal was to create an economic and “humanitarian” dependence of North on South Korea as a means of preparing reunification. Once the two Korean states had recognised each other diplomatically, they both became members of the United Nations in September 1991. Three months later, North and South signed an agreement on “reconciliation, non-aggression, trade and collaboration”. Although not yet a peace treaty, this agreement officially ended the state of war between the two Koreas. As the South Korean government pointed out at the time, the peace treaty it had been calling for had been prevented by the refusal of the United States to diplomatically recognise North Korea. This attitude of Washington undermined the policy of the “Sunshiners”, so that a new president, Kim Young Sam, with the support of the US president Bill Clinton, reverted to the policy of aggressive containment of the North. This latter policy takes as its model the so-called Kennan Doctrine developed by the USA against the USSR in the course of the Cold War. It consists of the military encirclement and economic strangulation of one’s enemy, in order to bring its regime to its knees. In 1994, in response to North Korean steps to develop nuclear weapons, US President Clinton considered a preventive strike against the regime’s nuclear power plants. Despite the renouncing of nuclear weapons by North Korea in the Geneva accord of autumn 1994, the US hardened their stance towards North Korea. The renewed aggravation of the inner-Korean conflict which resulted certainly contributed to the gravity of the famine which afflicted North Korea between 1995 and 1998. This catastrophe, in turn, was used by the Sunshiners to launch a new bid for power. The founder of the giant Hyundai concern, Chung Ju Yung, is said to have put the economic strangulation policy of the Seoul government in question in 1998 by symbolically donating one thousand cows to the North. At the beginning of the year 2000 Kim Dae-jung, the most prominent advocate of the Sunshine policy, and who had won the presidential elections on this basis, met his northern counterpart Kim Jong Il (the father of Kim Jong-un). The reluctance of the North to participate in this “historic summit” had to be overcome with the help of a payment of 186 million dollars provided by the Hyundai concern – a deal made with the help of the head of the South Korean secret service . This was followed, in 2004, by an important economic venture: the establishment, in Kaesong, North Korea, of a special economic zone on the Chinese model, where South Korean companies could invest and exploit the cheap North Korean labour power. For his Sunshine policy, Kim Dae-jung was awarded the Nobel peace prize. But it also brought him, and his successor Roh Moo-hyun, the opposition of their South Korean rivals, and of the United States. North Korea was furious about the triumphant return of the Sunshiners in the south. To understand why, one only has to look at what happened in Germany. There, the Stalinist-ruled East Germany was swallowed lock, stock and barrel in 1990. In such a situation, the North Korean Stalinists would risk not only losing their power, as happened in East Berlin, but their lives. The more conciliatory approach from Seoul was unable to disperse the fears of the Stalinists in Pyongyang sensing this might be the beginning of the end of North Korea. The hopes of the Sunshiners that the regime in the north might support its policy of “transformation through cooperation” seemed to have been dashed. And the Sunshine policy did not receive any support from Washington. After the intermezzo of the impeached Park Gyun-he, who stood for a more confrontational course towards the North, Moon took over in 2017. Moon came to power as a staunch defender of the “Sunshine” doctrine of dialogue and cooperation rather than confrontation with the North. He was reportedly outraged about the new escalation between North Korea and the United States. He at least initially put in question the decision of Donald Trump (taken apparently without consulting the Moon government) to install the American THAAD anti-missile system in South Korea, a step which had been planned already under Park Gyun-he, the impeached president. Instead of taking the side of Donald Trump in the present conflict, the government in Seoul was initially calling for restraint from both sides. However, after the most recent nuclear tests and threats Moon suddenly called for the deployment of US atomic weapons and rammed through the installation of new missile systems such as THAAD in South Korea. In addition, the radius of South-Korean missiles (so far limited to a distance of 800 km) and their carrying capacity of 500 kg is to be increased significantly. It is too early to conclude that all this means an irreversible abandoning of his Sunshine policy, but it certainly puts it at risk. In all these countries the ruling class tries to pull the working class onto a nationalist terrain. But the working class must refuse to be lured into the trap. True, the combativity and consciousness of the working class in North Korea are hard to assess. In the face of daily surveillance and terror, any resistance would have to be massive and would immediately confront the state and its military and police apparatus. This seems unlikely at the moment. Moreover, the effects of the UN sanctions will not strangle the North Korean regime; but they will hit the working class above all. Whenever its rulers greet successful missile tests the workers and peasants know that new sanctions are on the horizon, for which they have to pay the bill. And they know that their rulers do not care about the risk of starvation. All the more weight therefore lies on the shoulders of the working class in South Korea and China. Although decades of “anti-communist campaigns” have distorted the view of many workers about communism, South Korean and Chinese workers have in the last few decades engaged in many militant and massive struggles, which is an indication that they will not be willing to sacrifice themselves in an imperialist war for their exploiters. And whatever the level of resistance in the working class, to confront the war drive it is essential that there is present within the class a voice defending the oldest principle and slogan of the working class - “Workers have no fatherland”. This is why we support the internationalist leaflet which the comrades of the Korean group International Communist Perspective wrote and which we publish here. We do have some criticisms of this statement, in particular its focus on the installation of THAAD, which could give rise to the idea that single-issue campaigns are the equivalent of the workers’ struggle to defend their interests against the demands of the war machine. It is not by campaigning against this or that weapons system that the working class can develop its consciousness. The task of revolutionaries is to expose the impasse of the whole system, while participating in struggles for class demands that can tear apart the illusions of a “national unity” and develop a real solidarity with workers in other countries. However, different points of view should be debated amongst internationalists and should not prevent them from combining to defending their shared principles. We can recall that Lenin and Rosa Luxemburg, after the outbreak of World War One, fought together against the imperialist conflict, but debated heatedly over the national question. We thus unreservedly stand in solidarity with the ICP comrades and all those fighting for real internationalism in this region. The US Foreign Secretary Powell and British Prime Minister Blair all warned that nuclear weapons were already available to Saddam Hussein; as it turned out this was “fake news'” and a pretext for the invasion of Iraq in 2003. The reasons for the impeachment of Park Gyun-he were multifold: on the one hand there was the power struggle between “Sunshiners” and “confrontationists”, and we can assume that the latter pulled some of the strings in the big wave of protest against Park Gyun-he; at the same time the outrage in the population about the high level of corruption also contributed to her demise. At any rate all of this was used to ramp up the image of democracy.